For Better - Or What? : Breakfast in Bed? Maybe. 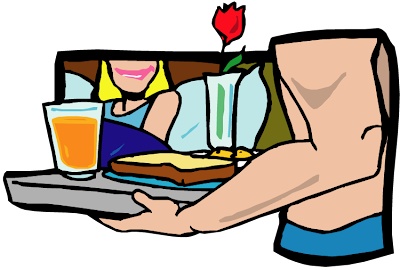 One suggestion that appears repeatedly in the search for advice on how to be more romantic is to surprise your sweetheart with breakfast in bed. This sounds like fun, but there may be some problems. Some people are not hungry when they wake up in the morning. For them, a tray full of pancakes and bacon may seem disgusting rather than delicious. A lot of people feel groggy and unattractive first thing in the morning and prefer to wash up before interacting with anyone. Bad breath, tangled hair and puffy eyelids may not put them in the mood for a friendly encounter. If the kids are involved, they may make such a mess in the kitchen that your spouse feels more annoyed than rewarded. Eating in bed can lead to crumbs in bed. Here are some ways you can ensure that breakfast in bed will be a real treat. Tell your sweetie what's happening, so he or she will have a chance to freshen up while you get things ready. Use a spare sheet as a "tablecloth" to keep crumbs from getting in bed with you. Keep the kids out of it. Wake up before they do and remember to lock your door. Serve something special, like french toast with chocolate syrup, or strawberries and whipped cream. If your bedroom is large enough to accommodate a small tray table and a couple of chairs, you can have breakfast in the bedroom, like in a luxury hotel suite. The bed is still conveniently available.